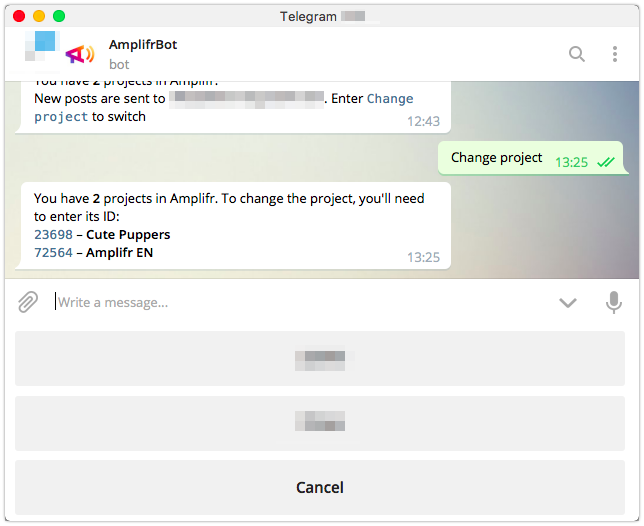 Amplifr has its own chatbots for Telegram Messenger and Facebook Messenger. Via the bots, you can manage posts and receive reports on your social media performance right in your messenger of preference. Here’s a guide on how to set the bots up to work and what they can do for you. By Daria, Project manager at Rocketbank. Return back to telegram and type /start or press Start again. 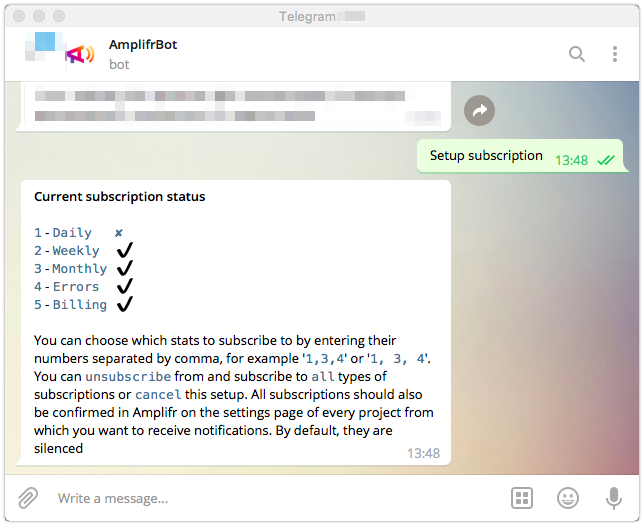 After this step, you should be all set to start using Amplifr Telegram Messenger bot. 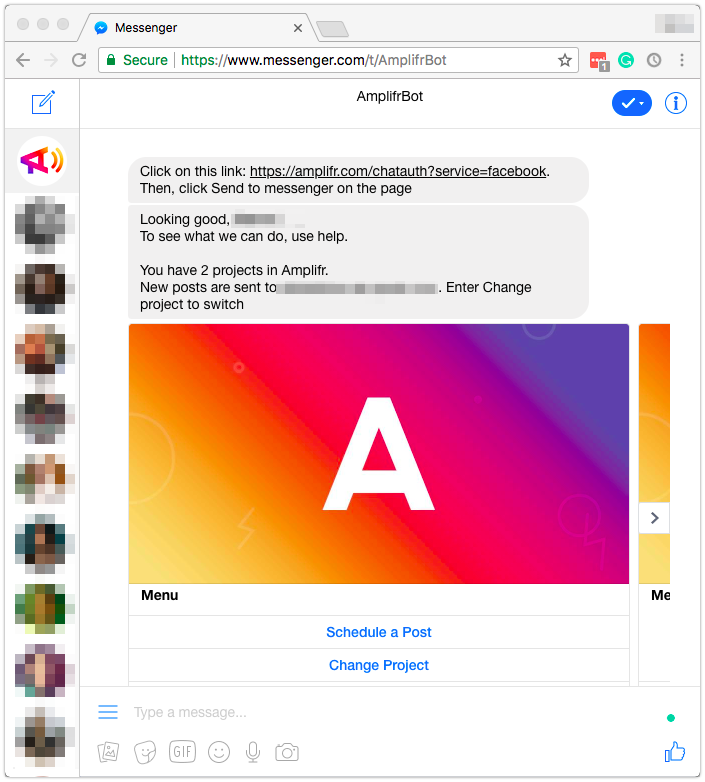 That’s it, Amplifr Facebook Messenger bot is now at your service! 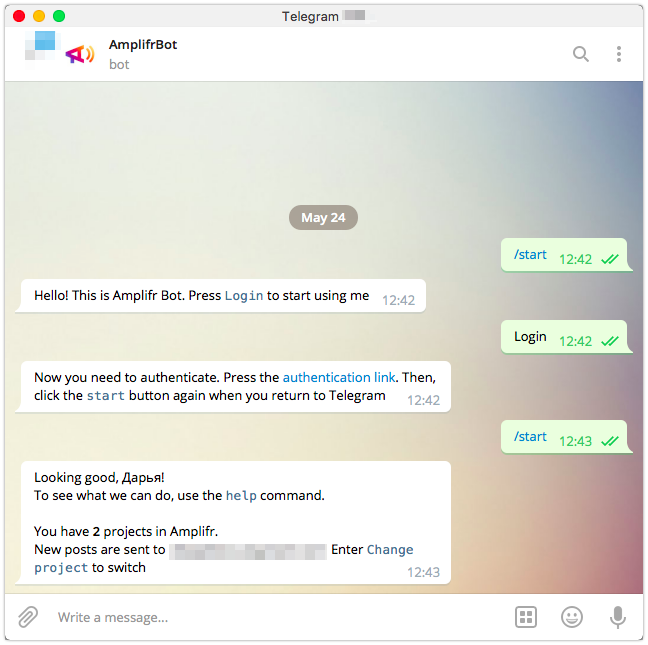 Our chatbots for Telegram Messenger and Facebook Messenger both have similar features, so you can feel comfortable working from your messenger of choice. I’ll show what you can do using our bots using the Telegram bot as an example. After you connect your account to any of the bots, the bot will show you how many projects you can post to and will choose your main project by default. To switch projects, type Change project. 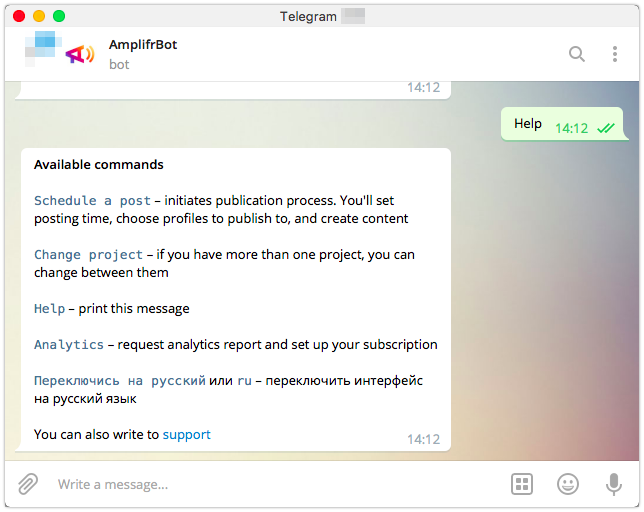 The bot will show you all the available projects and will ask you to type a number assigned to the project you need. You can request project stats using a chatbot. To do so, type Analytics, and then choose the time period you want the analytics on (I chose Weekly stats). You can also receive post stats by using a post link and respective command. The bot will include stats on Subscriber count, number of Likes, Shares, and Comments, and your most successful post links in the report. 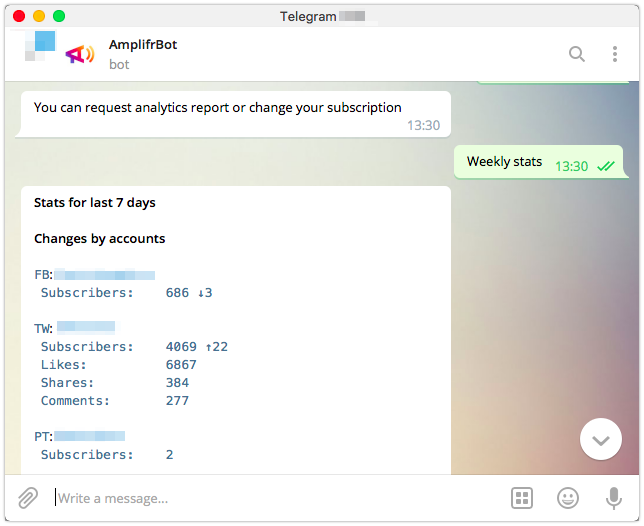 You can subscribe to receiving daily, weekly, and monthly Amplifr analytics via chatbots, and also receive payment due dates and unlikely error messages. To make a subscription, type Setup subscription in the Analytics menu, and choose which stats to subscribe to. 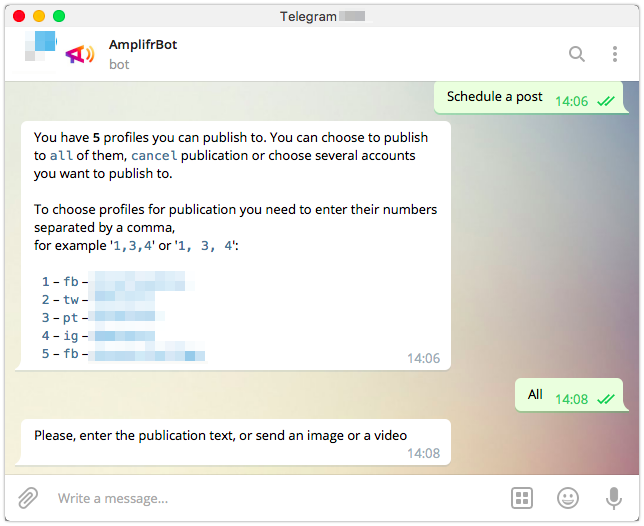 You can post to social accounts connected to your projects in Amplifr via our Bots. You can add images and videos to your posts as well. To post something, type or press Schedule a post and choose social accounts to post to. Then enter the post text, or send an image or video. After you’re done, the bot will ask you again if you want to post your content right away or schedule it to come out at a certain time. The bot can also preview the posts for you. Type or press Help to receive a list of all commands available in current menu and a support contact. Sometimes Telegram and Facebook Messengers experience difficulties, and it influences the chatbots as well. It doesn’t happen often, but it can cause bot malfunction that can last for a couple hours. If the bot does not respond to your command, try it again after some time, or consider using messenger desktop clients if you were on mobile, and vice versa. It does help sometimes. We’re always here to help you at help@amplifr.com and in our in-app Intercom chat. And how this page will affect your SEO. Here's how we make social media data analysis a little less complicated.